Our top notch tree and shrub service division has been servicing the metro Atlanta area since 1988. We have worked to build a reputable program to provide our customers with excellence in customer service and knowledgeable, on-sight technicians. Kemko's lawn services packages provide the right tree and shrub services, weed control, and pest control for your home in Loganville GA. Our affordable, friendly, and professional services make it easy for you to enjoy your yard more this year than you ever have before. 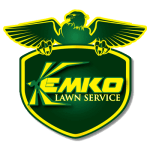 Kemko has been handling my lawn, tree and shrub fertilizing, weed, and fungus control for three years. No problems and quality service. Very knowledgeable people. This program consists of seven services and is aimed at the beautification and maintenance of your existing foliage. Starting in January, we apply insecticide, miticide, fungicide, and a foliar fertilizer to give plants a boost about every 6 weeks until November. (A sticker-spreader is also included so that the treatment can not be washed away in case of rain.) Then we start the seventh and last application, which is a complete slow release fertilizer applied as a liquid or a granular. We can also keep the weeds out of all of your natural areas with our bed care program. Call now or request an estimate online.